When I heard I was going to lead the project to conserve this petticoat I got very excited as it is a rare example of royal underwear, with a very personal connection to Queen Victoria. As a new acquisition for our Royal Ceremonial Dress Collection I had to start from the beginning to really get to know the object. Have you ever thought what happens when a new object comes into our studio? The first tools a conservator uses are their eyes. Tiny details can reveal a lot about the object, the story of how it was made and also what has happened to it during the last 180 years. 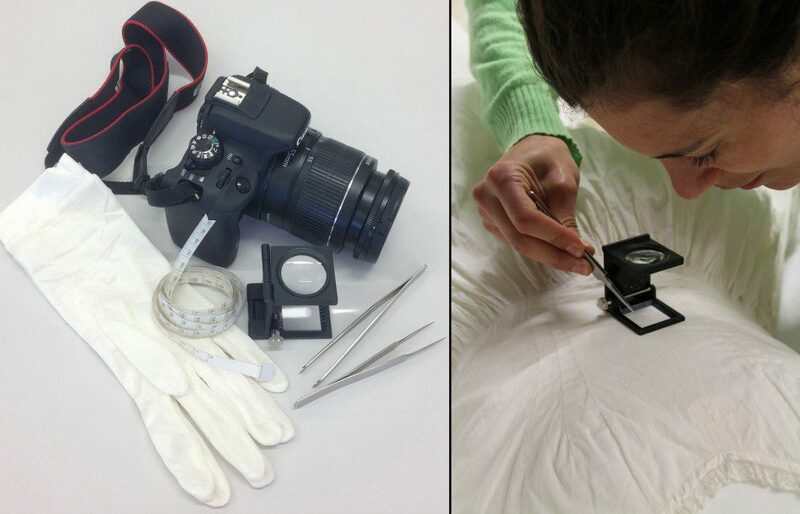 We might also have a little help coming from our conservator’s toolkit, which we always carry: a magnifier; gloves; tweezers; a tape measure; a good camera and a portable computer to capture every detail. Accurate documentation is critical as it contains everything about the object, a bit like a medical record. This includes a description of the construction and the condition of the object, as well as details of our plans to conserve it. A treatment proposal for the conservation, display and storage methodology is included, which goes directly to our curators for discussion and approval. As my colleague Claudia described in the previous post this petticoat is beautifully made and the stitching is so perfect that I thought it could be an early example of machine stitching, but in fact it is all stitched by hand in tiny, perfectly regular stitches. The fabric is also stunning, a very fine cotton woven in plain weave with 52 weft and 57 warp threads per cm. The high number of threads per cm gives the fabric a very soft and dense feel, certainly fit for a queen but has also helped it survive in such good condition for 180 years. The cotton is overall quite strong, other than a few splits in the skirt that we can imagine were caused by the wearer getting it caught somewhere whilst getting dressed. The lace also has a few splits and two buttonholes at the back fastening have frayed. The petticoat is also quite creased and yellowed due to light exposure and dirt. 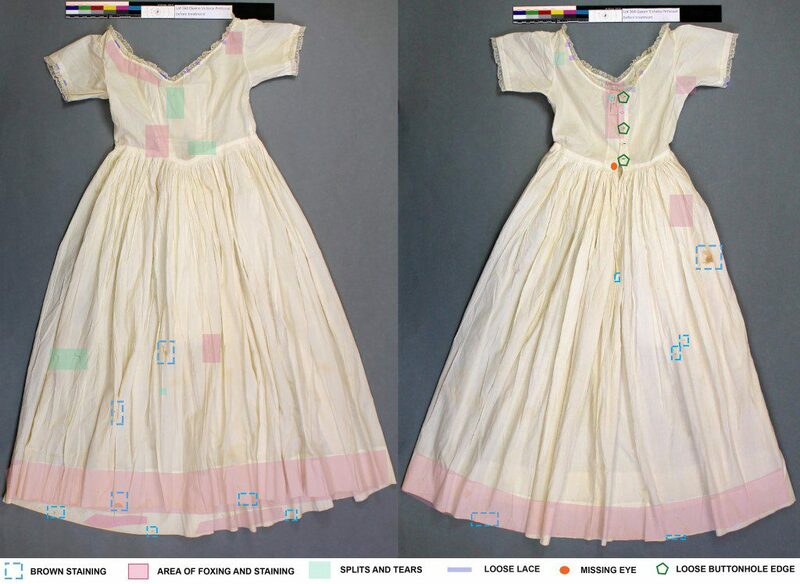 There are a few large brown stains on the skirt and other small ones that paper conservators call foxing appear across the fabric. Everything has now been carefully documented and summarised, with diagrams, and I am now ready to discuss my preferred conservation approach with Claudia, our curator. Don’t miss the next blog posts if you want to find out how the petticoat gets on! In our next blog post: the petticoat gets a bath. Find out how we clean the dirt and reduce the staining on the petticoat.